Shortly after Cooper Hewitt opened on December 12, 2014, the museum hosted a private event. At that preliminary scoping for the event, I bumped into Nick Bartzokas who had written a spiffy little application that he was planning on using for visuals on the night. We got talking and it turned out that he’d made it using the Cooper Hewitt API – all with no prompting. Even though it didn’t end up getting fully used, he has released it along with the source code. Tell me a bit about yourself, what do you do, where do you do it? I’m a creative coder. I like trying out new things. That’s lead me to develop a wide variety of projects: educational games, music visualizations, a Kinect flight simulator, an interactive API-fed wall of Arduinos and Raspberry Pis. These days I’m making interactive installations for the LAB at Rockwell Group. I came to the LAB from the American Museum of Natural History, so museums are in my blood, too. The LAB is a unique place. We’re a team of designers, thinkers, and technologists exploring ways to connect the digital with the physical. You made a web app for an event at Cooper Hewitt, what was the purpose of it, what does it do? Our friends at Metropolis celebrated their magazine’s redesign at the Cooper Hewitt in December 2014. The LAB worked on a one-night-only interactive installation that ran on one of the museum’s 84″ touchtables. We love to experiment, so when opportunities like this come up, we jump at the chance to pick up a new tool and create. It gives you an update and render cycle that’s familiar territory for those that work with other game engines or creative coding toolkits like openFrameworks. It handles user input and asset management well. It has three physics engines of ranging sophistication, from simple Arcade collisions to full-body physics. You can choreograph sprites using built-in tweening. It has PIXI integrated under the hood, which supplies fast graphics with useful shaders and the ability to roll your own. So, lots of range. It’s a great tool for rapid browser-based prototyping. The prototype we completed for the event brought Metropolis magazine’s digital assets to life. Photos drifted like leaves on a pond. When touched, they attracted photos of similar objects, assembling into flower petals and fans. If held, they grew excited until bursting apart. It ran in a fullscreened browser and was reponsive to over 40 simultaneous touch points. Here’s that version in action. For the other prototype, I used Cooper Hewitt’s API to generate fireworks made of images from the museum’s collection. Since the collection is organized by color, I could ask the API for all the red images in the collection and turn them into a red firework burst. I thought this project was really cool, so while it wasn’t selected for the Metropolis event, I decided to complete it anyway and post it..
OMG! You used the Cooper Hewitt API! How did you find out about the API? What was it like to work with the API? What was the best and the worst thing about the API? When the LAB begins a project, we start by considering the story. We were celebrating the Metropolis magazine redesign. Of course that was the main focus. But their launch party was being held at the Cooper Hewitt, and they wrote about Caroline Baumann of the Cooper Hewitt in their launch issue, so the museum was a part of the story. We began gathering source material from Metropolis and Cooper Hewitt. It was then that I re-discovered the Cooper Hewitt API. It was something I’d heard about in the buzz leading up to the museum’s reopening, but this was my first time encountering it in the wild. You all did a great job! Working with the API was so straightforward. Everything was well designed. The API website is simple and useful. The documentation is clear and complete with the ability to testdrive API methods in the browser. The structure of the API is sensible and intuitive. I taught a class on API programming for beginners. It was a challenge to select APIs with a low barrier to entry that beginners would be excited about and capable of navigating. Cooper Hewitt’s API is on my list now. I think beginners would find it quick, easy, and rewarding. 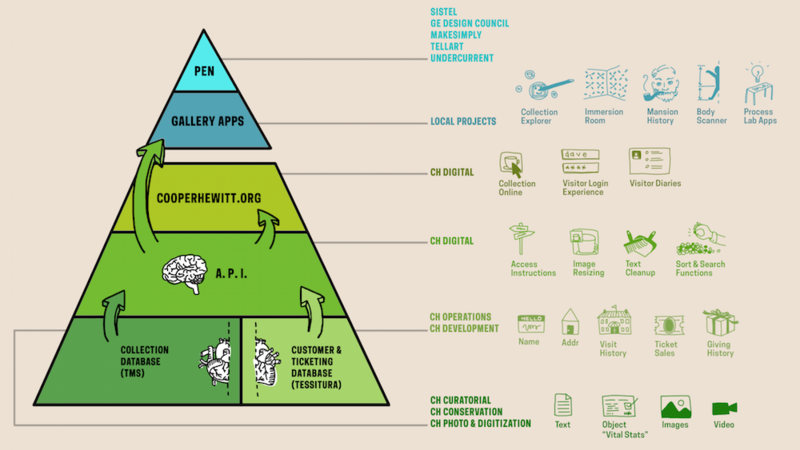 The pyramid diagram on the home page was a nice touch, a modest infographic with a big story behind it. It gives the newcomer a birds eye view of the API, the new gallery apps, the redesigned museum, all the culmination of a tremendous collaboration. The ability to search the collection by color immediately jumped out to me. That feature is just rife with creative possibilities. My favorite part, no doubt. In fact, I think it’s worth expanding on the API’s knowledge of color. It knows an image contains blue, but perhaps it could have some sense of how much blue the image contains, perhaps a color average or a histogram. In preparing a nodejs app to pull images for the fireworks, I checked to see if someone had written a node module for the Cooper Hewitt API, expecting I’d have to write my own. I was pleasantly surprised to see that the museum’s own Micah Walter authored one . That was another wow moment. When an institution opens up an API, that’s good. But this is really where Cooper Hewitt is building a bridge to the development community. It’s the little things. So if others want to play with what you made where can they find it? Folks can interact with the prototype here and they can peek at the source code on GitHub. Thanks for having me, and congratulations on the API, the museum’s reopening, and a job well done! This entry was posted in Experimental and tagged API, rockwell lab on March 27, 2015 by Seb Chan. One of my longer-term projects since joining the museum has been rethinking how the search feature functions on the collections website. As we get closer to re-opening the museum with a suite of new technologies, our work in collaboration with Local Projects has prompted us to take a close look at the moving pieces that comprise the backend of our collections site and API. Search, naturally, forms a large piece of that. Last week, after a few weeks of research and experimentation, I pushed the first iteration live. In this post, I’ll share some of the thoughts and challenges that informed our changes. Platform: The software that actually does the searching. The general process is that we feed data to the platform (see “index”), and then we ask it for results matching a certain set of parameters (see “query”). Everything else is handled by the platform itself. Part of what I’ll get into below involves our migration from one platform, Apache Solr, to another, Elasticsearch. Index: An index is the database that the search platform uses to perform searches on. The search index is a lot like the primary database (it probably could fill that role if it had to) but it adds extra functionality to facilitate quick and accurate retrieval of search results. Query: The rules to follow in selecting things that are appropriate to provide as search results. For users, the query could be something like “red concert poster,” but we have to translate that into something that the search provider will understand before results can be retrieved. Search providers give us a lot of different ways we can query things (ranges of a number, geographic distance or word matching to name a few), and a challenge for us as interface designers is to decide how transparent we want to make that translation. Queries also allow us to define how results should be sorted and how to facet results. Faceting/Aggregation: A way of grouping results based on traits they posses. For example, faceting on “location” when you search our collection for “cat” reveals that 80 of our cat-related things are from the USA, 16 are from France, and so on. Our old search functionality showed its symptoms of under-performance in a few ways. For example, basic searches — phrases like “red concert poster” — turned up no results despite the presence of such objects in our collection, and searching for people would not return the person themselves, only their objects. These symptoms led me to identify what I considered the two big flaws in our search implementation. On the backend, we were only indexing objects. This meant that if you searched for “Ray Eames,” you would see all of the objects we have associated with her, but to get to her individual person page, you would have to first click on an object and then click on her name. Considering that we have a lot of non-objects1, it makes sense to index them all and include them, where relevant, in the results. This made my first objective to find a way to facilitate the indexing and querying of different types of things. Our search provider, Solr, requires that a schema be present for every type of thing being indexed. The schema (an XML file) tells Solr what kind of value to expect for a certain field and what sort of analysis to perform on the field. This means I’d have to write a schema file — anticipating how I’d like to form all the indexed data — for each new type of thing we want to search on. One of the features of Elasticsearch is that it is “schemaless,” meaning I can throw whatever kind of data I want at the index and it figures out how to treat it. This doesn’t mean Elasticsearch is always correct in its guesses — for example, it started treating our accession numbers as dates, which made them impossible to search on — so it also gives you the ability to define mappings, which has the same effect as Solr’s schema. But if I want to add “people” to the index, or add a new “location” field to an object, using Elasticsearch means I don’t have to fiddle with any schemas. This trait of Elasticsearch alone made worth the switch (see Larry Wall’s first great virtue of programmers, laziness: “the quality that makes you go to great effort to reduce overall energy expenditure”) because it’s important to us that we have the ability to make quick changes to any part of our website. Before building anything in to our web framework, I spent a few days getting familiar with Elasticsearch on my own computer. I wrote a python script that loops through all of the CSVs from our public collections repository and indexed them in a local Elasticsearch server. From there, I started writing queries just to see what was possible. I was quickly able to come up with a lot of the functionality we already have on our site (full-text search, date range search) and get started with some complex queries as well (“most common medium in objects between 1990-2000,” for example, which is “paper”). This code is up on Github, so you can get started with your own Cooper Hewitt search engine at home! Once I felt that I had a handle on how to index and query Elasticsearch, I got started building it into our site. I created a modified version of our Solr indexing script (in PHP) that copied objects, people, roles and media from MySQL and added them to Elasticsearch. Then I got started on the endpoint, which would take search parameters from a user and generate the appropriate query. The code for this would change a great deal as I worked on the frontend and occasionally refactored and abstracted pieces of functionality, but all the pieces of the pipeline were complete and I could begin rethinking the frontend. Updating the frontend involved a few changes. Since we were now indexing multiple categories of things, there was still a case for keeping a per-category search view that gave users access to each field we have indexed. To accommodate these views, I added a tab bar across the top of the search forms, which defaults to the full-collection search. This also eliminates confusion as to what “fancy search” did as the search categories are now clearly labeled. The next challenge was how to display sorting. Previously, the drop-down menu containing sort options was hidden in a “filter these results” collapsible menu. I wanted to lay out all of the sorting options for the user to see at a glance and easily switch between sorting modes. Instead of placing them across the top in a container that would push the search results further down the page, I moved them to a sidebar which would also house search result facets (more on that soon). While it does cut in to our ability to display the pictures as big as we’d like, it’s the only way we can avoid hiding information from the user. Placing these options in a collapsible menu creates two problems: if the menu is collapsed by default, we’re basically ensuring that nobody will ever use them. If the menu is expanded by default, then it means that the actual results are no longer the most important thing on the page (which, on a search results page, they clearly are). The sidebar gives us room to lay out a lot of options in an unobtrusive but easily-accessible way2. Switching between sort mode and sort order. The final challenge on the frontend was how to handle faceting. Faceting is a great way for users who know what they’re looking for to narrow down options, and a great way for users who don’t know what they’re looking for to be exposed to the various buckets we’re able to place objects in to. Previously on our frontend, faceting was only available on fancy search. We displayed a few of the faceted fields across the top of the results page, and if you wanted further control, users could select individual fields to facet on using a drop-down menu at the bottom of the fancy search form. When they used this, though, the results page displayed only the facets, not the objects. In my updates, I’ve turned faceting on for all searches. They appear alongside the search results in the sidebar. We initially rolled these changes out about 10 days ago, though they were hidden from users who didn’t know the URL. This was to prove to ourselves that we could run Elasticsearch and Solr alongside each other without the whole site blowing up. We’re still using Solr for a bit more than just the search (for example, to show which people have worked with a given person), so until we migrate completely to Elasticsearch, we need to have both running in parallel. A few days later, I flipped the switch to make Elasticsearch the default search provider and passed the link around internally to get some feedback from the rest of the museum. The feedback I got was important not just for working out the initial bugs and kinks, but also (and especially for myself as a relative newbie to the museum world) to help me get the language right and consider all the different expectations users might have when searching our collection. This resulted in some tweaks to the layout and copy, and some added functionality, but mostly it will inform my bigger-picture design decisions going forward. Improving performance wasn’t a primary objective in our changes to search, but we got some speed boosts nonetheless. There are also cases where queries that turned up nothing before now produce relevant results, like “red concert poster,” (0 -> 11 results) “German drawings” (0 -> 101 results) and “checkered Girard samples” (0 -> 10 results). Getting the improved search in front of users is the top priority now – that means you! We’re very interested in hearing about any issues, suggestions or general feedback that you might have — leave them in the comments or tweet us @cooperhewittlab. I’m also excited about integrating some more exiting search features — things like type-ahead search and related search suggestion — on to the site in the future. Additionally, figuring out how to let users make super-specific queries (like the aforementioned “most common medium in objects between 1990-2000”) is a challenge that will require a lot of experimentation and testing, but it’s definitely an ability we want to put in the hands of our users in the future. New Search is live on our site right now – go check it out! 1 We’ve been struggling to find a word to use for things that are “first-class” in our collection (objects, people, countries, media etc.) that makes sense to both museum-folk and the laypeople. We can’t use “objects” because those already refer to a thing that might go on display in the museum. We’ve also tried “items,” “types” and “isas” (as in, “what is this? it is a person”). But nothing seems to fit the bill. 2 We’re not in complete agreement here at the labs over the use of a sidebar to solve this design problem, but we’re going to leave it on for a while and see how it fares with time. Feedback is requested! This entry was posted in Backends, Experimental, Interaction Design and tagged Larry Wall on August 21, 2014 by Sam Brenner. Have you ever wanted to see a real-time view of all the objects that people are looking at on the collections website? Now you can! At least for objects with images. There are lots of opportunities to think about interesting ways to display objects without images but since everything that follows has been a weekends-and-mornings project we’ve opted to start with the “simple” thing first. We have lots of different ways of describing media: 12, 865 ways at last count to be precise. The medium with the most objects (2, 963) associated with it is cotton but all of these numbers are essentially misleading. The history of the cataloging of the collection has preferenced precision and detail over the kind of rough bucketing (for example, tags) that lots of people are used to these days. Alas, your browser does not support the video element. It’s a practice that can sometimes seem frustrating in the moment but, in the long-run, we’re better served for it. In time we will get around to assigning high-level categorizations for equally high-level browsing but it’s worth remembering that the practice of describing objects in minute detail predates things like databases, which we take for granted today. In fact these classifications, and their associated conventions and rituals, were the de-facto databases before computers or databases had even been invented. But 13,000 different media, most of which only describe a single object, can be overwhelming. Where do you start? How do you know what to look for? Given the breadth of our collection what don’t we have? And given the level of detail we try to assign to objects how to do you whether a search doesn’t yield any results because it’s not in our collection or simply because we’re using a different name for the same thing you’re looking for? This is a genuinely Big and Hairy Problem and we have not solved it yet. But the ability to relay objects as they are viewed by the public, in real-time, offers an interesting opportunity: What if we just displayed (and where possible, read aloud) the medium for that object? That’s all The Medium is the Message does: It is an ambient display that let you keep an eye on the kinds of things that are in our collection and offered a gentle, polite way to start to see the shape of all the different things that tell the story of the museum. It’s not a tool to help you take a quiz so much as a way to absorb an awareness of the collection as if by osmosis. To show people an aspect of the collection as an avenue to begin understanding its entirety. We’re not thinking enough about sound. If we want all these things to communicate with us, and we don’t want to be starting at screens and they’re going to do more than flash a couple of lights, then we need to work with sound. Either ‘sound effects’ that mean something or devices that talk to us. Personally, I think it’ll be the latter morphing into the former. And this is worth thinking about because it’s already creeping up on us. Self-serve checkouts are talking at us, reversing trucks are beeping at us, trucks turning left are barking at us, incoherently – all with much less apparent thought and ‘design’ than we devote to screens. While The Medium is the Message is a full-screen application that displays a scaled-up version of the square-crop thumbnail for an object it also tries to use your browser’s text-to-speech capabilities to read aloud that object’s medium. It may not be the kind of thing you want playing in a room full of people but alone in your room, or under a pair of headphones, it’s fun to imagine it as a kind of Music for Airports for cultural heritage. Text-to-speech is currently best supported in Chrome and Safari. Conversely the best support for crisp and pixelated image-rendering is in Firefox. Because… computers, right? Eventually we hope to merge it back in to the main collections website but since it’s all brand-new we’re going to put it some place where it can, if necessary, have little melt-downs and temper-tantrums without adversely affecting the rest of the collections website. It’s also worth noting that some internal networks – like at a big company or organization – might still disallow WebSockets traffic which is what we’re using for this. If that’s the case try waiting until you’re home. And now, for the Nerdy Bits: The rest of this blog post is captial-T technical so you can stop reading now if that’s not your thing (though we think it’s stil pretty interesting even if the details sound like gibberish). Redis and in particular its implementation of Publish/Subscribe messaging paradigm – Every once in a while there’s a piece of software that is released which feels like genuine magic. Arguably one of the last examples of this was memcached originally written by Brad Fitzpatrick, for the website LiveJournal and without which entire slices of the web as we now know it wouldn’t exist. Both Redis and memcached are similar in spirit in that their feature-set is limited by design but what they claim to do Just Works™ and both have broad support across the landscape of programming languages. That last piece is incredibly important since it means we can use Redis to bridge applications written in whatever language suits the problem best. We’ll return to that idea in the discussion of “step 0” below. Websockets – WebSockets are a way for a web browser and a server to create and maintain a persistent connection and to shuttle messages back and forth. Normally the chatter between a browser and a server happens akin to the way two people might send each other postcards in the mail and WebSockets are more like a pair of teenagers calling each on the phone and talking for hours and hours and hours. Sort of like Pub/Sub for a web browser, right? WebSockets have been around for a few years now but they are still a bit of a new territory; super-cool but not without some pitfalls. Fun fact: The Labs’ very own Sam Brenner‘s ITP thesis project called Adventures of Teen Bloggers is an archive of old LiveJournal accounts in the shape of an 8-bit video game! In order to test all of those technologies and how they might play together we built pubsocketd which is a simple daemon written in Go that subscribes to a Pub/Sub channel and ferries those messages to a browser using Websockets (WS). That’s it. It is left up to WS clients (your web browser) to figure out what to do with those messages. The “step 0” in all of this is the ability for the collections website itself to connect to a Redis server and send a Pub/Sub message, whenever someone views an object, to the same channel that the pubsocketd server is listening to. This allows for a nice clean separation of concerns and provides a simple way for related, but fundamentally discrete, applications to interact without getting up in each other’s business. Given the scope of the project we probably could have accomplished the same thing, with less scaffolding, using Server-Sent Events (SSE) but this was as much an exercise designed to get our feet wet with both WebSockets and Go so it’s been worth doing it the “hard way”. Matthew Rothenberg, creator of the popular EmojiTracker, was nice enough to open-source the Go-based SSE server endpoint he wrote to feed his application and we may eventually re-write The Medium is the Message, or future applications like it, to use that. This entry was posted in Backends, Experimental on August 4, 2014 by asc. Now that I’ve written this blog post it occurs to me that it would be trivial to build something similar on top of the Cooper Hewitt Collections API — since that’s ultimately where all this colour stuff comes from — so I will probably do that shortly and stick in it the Play section. That’s something I wrote last week on my personal weblog. I was writing about a little web “application” that I’d made to generate algorithmic “multiforms” that recall the work of the late painter Mark Rothko. The source of the colors used to create these robot-multiforms are derived from photo uploads and extracted using the same code that the Cooper Hewitt uses to generate color palettes for the objects in our collection. We wrote about that process last year. These robot “paintings” are built by fetching three photos and using their primary color to fill one of three stacked rectangles that make up the canvas. A dominant color for a fourth photo is used along with an inset CSS3 box-shadow to give the illusion a fuzzy, hazy background on which the rectangles sit. Every 60 seconds a new version is generated and the colors (and boxes) gently transition from old to new. They’re not really Rothko paintings, obviously, and to suggest that they are would do the painter a disservice. Rothko’s paintings are not just any random set of colors stacked on top of one another. Rothko worked long and hard to choose the arrangement of his paintings and it’s easy to imagine that he would have been horrified by some of the combinations that Robot Rothko offers up. But like the experimental Albers Boxes feature they are a nod and gesture – and a wink – towards the real thing. See the #info part of that URL? That will cause the application to load with an information box that explaining what you’re looking at (and that will close itself automatically after 30 seconds). If you just want to jump straight to the application all you have to do is remove the #info from the URL. Robot Rothko will automatically update itself using random object records to create a new multiform every 60 seconds. Mouse over any color to see the object it represents. Click on the text to see our collection record for the object itself. Robot Rothko is native to the web which means it will work in any modern web browser whether it’s on your desktop or your phone or your tablet. It can be put it to fullscreen mode (by pressing shift-F) and if you save the website’s URL to your homescreen on your phone, or tablet, it is configured to launch without any of the usual browser chrome. If you use a Mac you can plug the URL for Robot Rothko in to Todd Ditchendorf’s handy Fluid.app which will turn it all in to a shiny desktop application. I am guessing there are equivalent tools for Windows or Linux but I don’t know what they are. Robot Rothko lives in a new section of the collections website called “Play“. The distinction between the Play section and the Experimental Features section of the website can probably be easiest thought of as: Experimental features are things that apply to the entirety of the collections website, while Play things are small contained applications that use the collections API and focus on or build off a particular aspect of the collection. The first of these was Sam Brenner’s SkyDesigner and Robot Rothko is actually the third such application. In between those two was What Would Micah Say? (WWMS) a quick end-of-day project to test out the W3C’s Text-to-Speech APIs that are starting to appear in some web browsers (read: Chrome and Safari as of this writing, and make sure you have the volume turned up). The WWMS “application” was mostly a simple 20-minute exercise to test whether fetching some content dynamically and feeding to the text-to-speech APIs actually works and produces something useable. It does, which is very exciting because it opens up any number of accessibility-related improvements we can starting thinking about adding to the collections website. That we happened to use the cooperhewitt.labs.whatWouldMicahSay API method and then configured the text-to-speech API to read his words as if spoken by a “French” robot made it all a little bit silly and a little more fun but those are important considerations. Because sometimes playing at – or making interesting – a technical problem is the best way to work through whether it is even worth pursuing in the first place. This entry was posted in Experimental and tagged API, colors, robot eyes on July 7, 2014 by asc. Greetings readers! My name is Sam and I’m the new Interactive Media Developer here at the Cooper-Hewitt’s Digital and Emerging Media department. I’m thrilled to be here with the opportunity to help design and build the future of the museum, both online and in-house. As part of my application for the position, I built SkyDesigner, a web application that lets users replace the color of the sky with a picture of a similarly-colored object from the Cooper-Hewitt’s collection. The “sky” idea comes from the original assignment, which was to create an application using both a weather API and the Cooper-Hewitt API, but you can use SkyDesigner to swap out colors from anything you can take a picture of (meaning, it’s great for selfies). Give it a try now! Here’s how it works: first, users take a picture. If they’re on a computer, they can use their webcam. If they’re on a smartphone, they can use the built-in camera. Android users get (in my opinion) the better experience, because Android supports getUserMedia – this means that users can start their camera and take a picture without ever having to leave the application. iOS doesn’t support getUserMedia yet, so they are sent off to the native iOS camera app to take their picture, which then gets passed back to the browser. Once I receive the picture, I load it into a canvas. In the next step, users tap on their picture to select a color. The color’s hex code is sent straight to the Cooper-Hewitt API’s search method, where I search for similarly-colored objects that have an associated image. While waiting for a response from the API, I also tell the canvas to make every pixel within range of the selected color become transparent. When I get the image back from the API, I load it in behind the canvas and presto! It shows through where the selected color used to be. Finally, the image is titled based on the object’s creator and your current weather information. Being a weekend project, there are some missing features – sharing is a big one – but I think it demonstrates the API’s ability to provide fresh, novel ways into a museum’s vast collection. Here’s the link again, and you can also find the source on GitHub. This entry was posted in Experimental and tagged computer vision, mashup, robot eyes on May 5, 2014 by Sam Brenner. Have you ever noticed the way people in museums always take pictures of object labels? On many levels it is the very definition of an exercise in futility. Despite all the good intentions I’m not sure how many people ever look at those photos again. They’re often blurry or shot on an angle and even when you can make out the information there aren’t a lot of avenues for that data to get back in to the museum when you’re not physically in the building. If anything I bet that data gets slowly and painfully typed in to a search engine and then… who knows what happens. As of this writing the Cooper-Hewitt’s luxury and burden is that we are closed for renovations. We don’t even have labels for people to take pictures of, right now. As we think through what a museum label should do it’s worth remembering that cameras and in particular cameras on phones and the software for doing optical character recognition (OCR) have reached a kind of maturity where they are both fast and cheap and simple. They have, in effect, showed up at the party so it seems a bit rude not to introduce ourselves. I mentioned that we’re still working on the design of our new labels. This means I’m not going to show them to you. It also means that it would be difficult to show you any of the work that follows in this blog post without tangible examples. So, the first thing we did was to add a could-play-a-wall-label-on-TV endpoint to each object on the collection website. Which is just fancy-talk for “another web page”. Now that every object on the collection website has a virtual label we can write a simple print stylesheet that allows us to produce a physical prototype which mimics the look and feel and size (once I figure out what’s wrong with my CSS) of a finished label in the real world. So far, so good. We have a system in place where we can work quickly to change the design of a “label” and test those changes on a large corpus of sample data (the collection) and a way to generate an analog representation since that’s what a wall label is. Careful readers will note that some of these sample labels contain colour information for the object. These are just placeholders for now. As much as I would like to launch with this information it probably won’t make the cut for the re-opening. Do you remember when I mentioned OCR software at the beginning of this blog post? OCR software has been around for years and its quality and cost and ease-of-use have run the gamut. One of those OCR application is Tesseract which began life in the labs at Hewlitt-Packard and has since found a home and an open source license at Google. Tesseract is mostly a big bag of functions and libraries but it comes with a command-line application that you can use to pass it an image whose text you want to extract. I think this is exciting. I think this is exciting because Tesseract does a better than good enough job of parsing and extracting text that I can use that output to look for accession numbers. All the other elements in a wall label are sufficiently ambiguous or unstructured (not to mention potentially garbled by Tesseract’s robot eyes) that it’s not worth our time to try and derive any meaning from. Conveniently, accession numbers are so unlike any other element on a wall label as to be almost instantly recognizable. If we can piggy-back on Tesseract to do the hard work of converting pixels in to words then it’s pretty easy to write custom code to look at that text and extract things that look like accession numbers. And the thing about an accession number is that it’s the identifier for the thing a person is looking at in the museum. To test all of these ideas we built the simplest, dumbest HTTP pony server to receive photo uploads and return any text that Tesseract can extract. We’ll talk a little more about the server below but basically it has two endpoints: One for receiving photo uploads and another with a simple form that takes advantage of the fact that on lots of new phones the file upload form element on a website will trigger the phone’s camera. This functionality is still early days but is also a pretty big deal. It means that the barrier to developing an idea or testing a theory and the barrier to participation is nothing more than the web browser on a phone. There are lots of reasons why a native application might be better suited or more interesting to a task but the time and effort required to write bespoke applications introduces so much hoop-jumping as to effectively make simple things impossible. "raw": "______________j________nDesign for Textile: Napkins for La Fonda delnSol RestaurantnnDrawing, United States ca. 1959nn________________________________________nOffice of Herman Miller Furniture CompanynnDesigned by Alexander Hayden GirardnnBrush and watercolor on blueprint grid on white wove papernn______________._.._...___.___._______________________nchocolate, chocolate, sandy brown, tannn____________________..___.___________________________nGift of Alexander H. Girard, 1969-165-327"
Do you notice the way, in the screenshot above, that in addition to displaying the accession number we are also showing the object’s title? That information is not being extracted by the “label-whisperer” service. Given the amount of noise produced by Tesseract it doesn’t seem worth the effort. Instead we are passing each accession number to the collections website’s OEmbed endpoint and using the response to display the object title. Here’s a screenshot of the process in a plain old browser window with all the relevant bits, including the background calls across the network where the robots are talking to one another, highlighted. But we proved that it can be done and, start to finish, we proved it inside of a day. It is brutally ugly and there are still many failure states but we can demonstrate that it’s possible to transit from an analog wall label to its digital representation on a person’s phone. Whether they simply bookmark that object or email it to a friend or fall in to the rabbit hole of life-long scholarly learning is left an as exercise to the reader. That is not for us to decide. Rather we have tangible evidence that there are ways for a museum to adapt to a world in which all of our visitors have super-powers — aka their “phones” — and to apply those lessons to the way we design the museum itself. We have released all the code and documentation required build your own “label whisperer” under a BSD license but please understand that it is only a reference implementation, at best. A variation of the little Flask server we built might eventually be deployed to production but it is unlikely to ever be a public-facing thing as it is currently written. We welcome any suggestions for improvements or fixes that you might have. One important thing to note is that while accession numbers are pretty straightforward there are variations and the code as it written today does not account for them. If nothing else we hope that by releasing the source code we can use it as a place to capture and preserve a catalog of patterns because life is too short to spend very much of it training robot eyes to recognize accession numbers. The whole thing can be built without any external dependencies if you’re using Ubuntu 13.10 and if you’re not concerned with performance can be run off a single “micro” Amazon EC2 instance. The source code contains a handy setup script for installing all the required packages. This entry was posted in CH 3.0, Experimental, Papernet, Publishing on January 25, 2014 by asc.